Weather proof camping – loads to do come rain or shine! Our camping pitches are spread over two fields; the Upper and Lower Fields. Both fields are situated just a few seconds walk from the Whitlingham Broad Visitor Centre and cafe and all the walks, activities and peaceful hideaways of the Country Park. The Upper Field is a car free haven, allowing more freedom to pitch, and ideal if you are camping with friends. Parking is just a few metres from the pitches and wheel barrows are available to help move stuff from your car to your perfect spot in the grass. The Lower Field offers, flat pitches and partly sits in the shade of a historic lime Tree Avenue This field can accommodate tents, campervans/small motorhomes, and trailers tents (by prior arrangement) sorry, no caravans. For those who prefer to have their car next to their tent (a handy haven if your tent mate is a snorer!) pitches on the lower field can accommodate one car. All additional cars and all campers on the Upper Field must park in our car park. 3 ladies loos and 2 gents loos plus urinals. 2 shower rooms (1 male, 1 female) – each containing 3 showers and a communal changing area with benches and clothes hooks. Bell tents come with firepits for use. 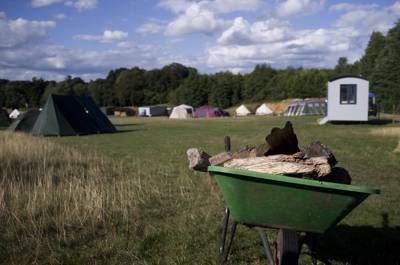 Campfires are allowed at all other pitches in raised firepit only – these are available to hire if required. Bell tents sleep up to 6 people and include: soft furnishings and fairy lights. The Whitlingham yurt includes: log burner, beds, sort furnishings, a gas BBQ and a hammock. The shepherds huts include: solar lighting, bedding, log burning stoves, a BBQ and a firepit. Grassy pitches with a 10 x 7m allowance, set over 2 fields (one welcomes campervans and cars, and the other car free). 6 furnished bell tents, 2 shepherd's huts and 1 yurt also available. The neighbouring Outdoor Education Centre offers plenty of broad-based aquatic activities including canoeing, dragon boat hire, sailing, windsurfing. The site is right on the Wherryman's Man and national Cycle Route One path. Norwich has attractions galore as well plenty of places to eat and drink. All year (pre bookings recommended at all times, and pre booking only in the winter season). Norwich train station is approx 35 mins walk (2.5 miles away). Book a ticket in advance and you can travel from London for as little at £8.